A new quality free newspaper for an up-and-coming M4 corridor town is being launched today. Regional publisher Trinity Mirror is launching the Bracknell Times as a “upgrade” on existing free title the Bracknell Forest Standard, which is being discontinued. Unlike its predecessor the new title will not be delivered door-to-door but will be available for free pick-up from newsagents, supermarkets, petrol stations and public buildings across the area. The new title will have an initial print run of more than 8,000. 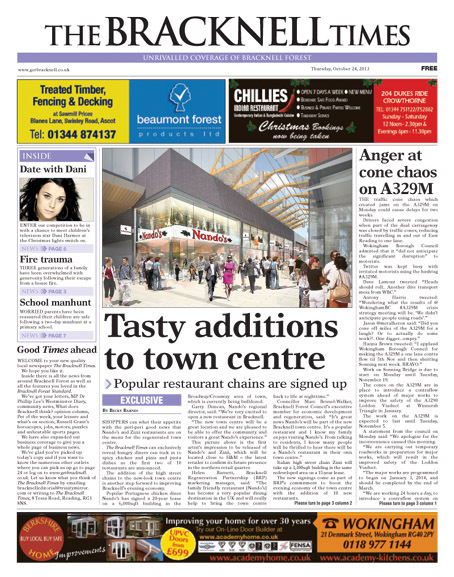 The rival paper, the Romanes Group-owned Bracknell News, has a paid-for circulation of 3,265. Andy Murrill, editorial director for Trinity Mirror’s local newspapers in Berkshire, announced the move in a story on companion website getreading. He wrote: “As the Bracknell regeneration begins to revolutionise our town, readers will also get an upgraded local newspaper that best reflects the aspirations of our blossoming borough. “As Bracknell town centre goes through such momentous changes we believe there has never been a bigger role to be played by your local newspaper. Andy said some popular features of the old paper would be retained including letters, the Q&A, the local opinion panel, Pet of the Week and the Back in the Day nostalgia column. The Times will be the sister paper to the award-winning Wokingham Times which was commended in the UK Weekly Newspaper of the Year category at the 2013 Newspaper Awards. The Bracknell Forest Standard which had a distribution of 27,488 in February 2013, the last time its figures were audited. It will be there as long as the ads are. Call that a fee press? Way to go Trinity, so you’ve killed a product that reached *36,000 adults every week across the Bracknell Forest Council area and replaced it with one that reaches 8,000. Let’s get this right that’s a 77.77% decrease in readership and this is described as an ‘upgrade’. Source: *Jicreg 1st May 2013 – RPC applied to pick up copies is 1. Preach the Reach evidently fails to appreciate the difference between circulation and readership. Readership is usually about two and a half to three times the circulation figure. Hence a circulation of 8,000 translates as roughly 24,000 readers. From the intro, I am wondering is it quality and free, or quality free?